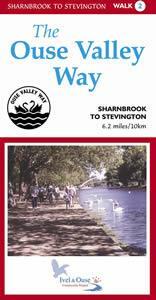 Ouse Valley Way-Sharnbrook to Stevington at Sharnbrook Walking RouteThe trail takes you through the picturesque Ouse valley with its meandering tree-lined river, historic villages and abundant wildlife. This section starts in Sharnbrook and follows the Ouse Valley through the attractive villages of Sharnbrook and Pavenham. Start/Finish Point: The route begins in Sharnbrook High Street. The route ends at Stevington Cross. Start Nat GR: SP996596 Finish SP989532. The trail takes you through the picturesque Ouse valley with its meandering tree-lined river, historic villages and abundant wildlife. This section starts in Sharnbrook and follows the Ouse Valley through the attractive villages of Sharnbrook and Pavenham. How to get there by car/Parking: Sharnbrook is in north Bedfordshire on the A6, about 10 miles north of Bedford. Car parking is available in Sharnbrook.